In what was roughly a two-hour software showcase, Apple’s WWDC 2018 keynote had very few big surprises: we had guessed iOS 12, watchOS 5 and tvOS 12 would make an appearance during the show (which they did), and while the Dolby Atmos announcement threw us for a loop, it’s probably not the kind of announcement that will compel you to drive to the store and purchase an Apple TV 4K. 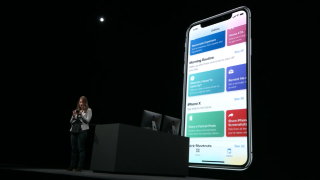 Sussing through today’s announcements, the one that stands above the rest is the formal announcement of Siri Shortcuts – an IFTTT-like function that lets you group smart home tasks together but in a comprehensive-but-approachable way that the DIY-centric IFTTT could have only dreamed of. Apple may get mocked for doing it, but this is a great example of the Cupertino-based company taking an idea that has long existed and repurposing it into something more accessible (read: palatable) to mainstream everyday users. While I’d love to scold them for it – it’s absolutely genius: Siri Shortcuts might be able to bring the smart home to the lazy masses (myself included). And while Apple has so far only mentioned Siri Shortcuts coming to iOS 12, if or when Apple decides to push Siri Shortcuts to devices like the Apple HomePod, it’s very possible that it could completely outclass the Amazon Echo and Google Home family of devices in the burgeoning smart home space. Siri Shortcuts: What is it? Siri Shortcuts is a feature of iOS 12 that allows you to use a basic drag-and-drop interface simply called Editor to teach Siri a specific phrase that corresponds to either a single command or a number of commands. It’s confusing on paper – an unfortunate aspect of anything smart home-related these days – and yet, in practice, it should be relatively easy to use. One example given on stage involved the Tile app on iPhone where SVP of Software Craig Federighi used the phrase “I lost my keys” to use the Tile app to find misplaced items attached to a Tile sensor. Now, it’s worth pointing out that both the command and the action were both suggested inside the app – Federighi didn't use the Editor. Despite being basic, though, that level of integration straight into apps you already use is what makes Siri Shortcuts potentially a much better start for people than IFTTT. So where things become more interesting is stringing apps together with a single phrase. A good example of that happened on-stage later when Kim Beverett from the Siri Shortcut project took the stage. In Beverett’s demo, she created a phrase called “Heading Home” that gave her an estimated time of arrival, sent a message to someone in her contacts, set her smart thermostat and turned on the fan, before opening Google Maps and turning on an NPR podcast for the ride home. It’s everything we’ve wanted a digital assistant to be in a single system that doesn’t require connecting a half-dozen services to your IFTTT account with mixed results. Siri Shortcuts requires you to be just as creative with the built-in Editor as you are with IFTTT, sure, but there’s little doubt in my mind that the final product will be easier, faster and more versatile than both IFTTT or Amazon Echo’s Skills platform. Before you go defending the oft trodden-on IFTTT, I understand that it’s not terribly difficult to set up a string of commands: You create a name for the command, connect the services/devices you want in that chain while giving the app the proper authentication/passwords and voila! The problem lies with the fact that IFTTT isn't something you hold in your hand everyday, let alone trust to hold your music, personal contacts, emails and the dozens of other liberties we lend to our iPads, iPhones, Macs and HomePods. It’s tied to a service that has to then be connected into the chain and be made aware of all the other services you use in your life. Siri Shortcuts, on the other hand, leverages the power of the App Store, that little known platform that has around 500 million visitors per week. Once appropriately harnessed by developers, creating routines will be as simple as stringing together the apps you already use at various times of the day and assigning a name. 'Breakfast' might be checking the weather, getting the estimated commute time, starting your daily news podcast and turning on a HomePod in your kid’s room to get them up and moving, while 'Good Night' could just be all the apps you use right before you want to call it a night. Importantly, there’s no need to ask developers to make special skills that work with a voice interface (cough, Amazon, cough) and the apps you’re most likely to use are already installed on your phone, removing IFTTT’s barrier to entry. If Siri Shortcuts is as developer-friendly as Apple says, there's no reason you won't see hundreds – if not thousands – of example commands before iOS 12 leaves beta – not as many Skills as most likely Alexa has, but ones that you're more likely to use, understand and be able to adjust to your needs, definitely. Feed Siri Shortcuts into the Apple HomePod – a speaker that already sounds better than the Amazon Echo – and you have the recipe for the consolidated smart home system we've been waiting for.